Congratulations to Rep. Mary Franson for winning the Republican endorsement for a third term in the Minnesota House of Representatives for House District 8B at the convention held Saturday, April 26 in Henning, MN. Delegates of the full Senate District 8 elected Owen Miller of Alexandria to be chairman of Senate District 8 for the next two years. Congratulations, also, to Owen. For the past four years Mary has been a leading voice for conservative values in Saint Paul. She has stood tough against the Democrats’ machine politics and she will continue to lead us into the future. Among other things, Mary has been the leading voice protecting thousands of business owners from Mark Dayton’s attempts to unionize independent day care providers in Minnesota. Please join us in thanking Mary for her hard work by checking out her campaign website at http://fransonforstatehouse.com/. While you are there, think about making a $50 refundable contribution to her campaign. Some may question why government moves so slowly and deliberately. Well, a big part of the reason is to avoid making mistakes. We almost made one this week as HF 2854 moved through the process and made its way to the House floor for action on Wednesday. The legislation was the “unsession bill” from the Department of Commerce. As you may have noticed, “unsession” has been a theme during this session as various departments get rid of unneeded and out-dated statutes. Among the provisions in this particular unsession bill was language that would have eliminated a provision containing the enforcement statutes for the blending of ethanol and other biofuels. Evidently, someone in the Commerce Department thought this particular provision was duplicative and therefore not needed. Turns out, that wasn’t the case, and if this particular provision had been taken off the books as part of the Commerce “unsession bill,” the result would have been no enforcement of the blending requirements for fuels sold in Minnesota. It took several committee stops and finally action on the House floor to add the required language back. I don’t think there was any attempt to actually strip the enforcement provision from statute, but it took quite a while before the mistake was corrected. In fact, it took two amendments on the House floor to make the change, as the first was written addressing a non-existing statute. 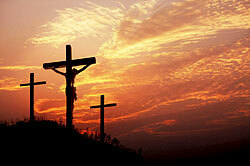 Holy week is a very emotional time for Christians, to even imagine what Jesus endured for our sakes. The “Good” in Good Friday is the Hope we have in Christ, knowing that there could not have been an Easter without a Good Friday.